I wanted to start this post with a great quote that hasn’t previously been used for a write-up about an avalanche. Not being able to come up with anything great, I referred to Bruce Tremper’s Staying Alive in Avalanche Terrain as I know Bruce has a world of quotes he uses when talking about snow and avalanches. So, thanks to Bruce for the 2 quotes above. This may be one of the most difficult blogs I have ever written even though it is on one of my favorite topics to talk about — snow and avalanches. It is difficult to write about an accident our group had on January 12 and to try to shed some light on why this happened and identify the mistakes we made. To get the good news out first, our avalanche accident did not result in any injuries so we are extremely lucky. 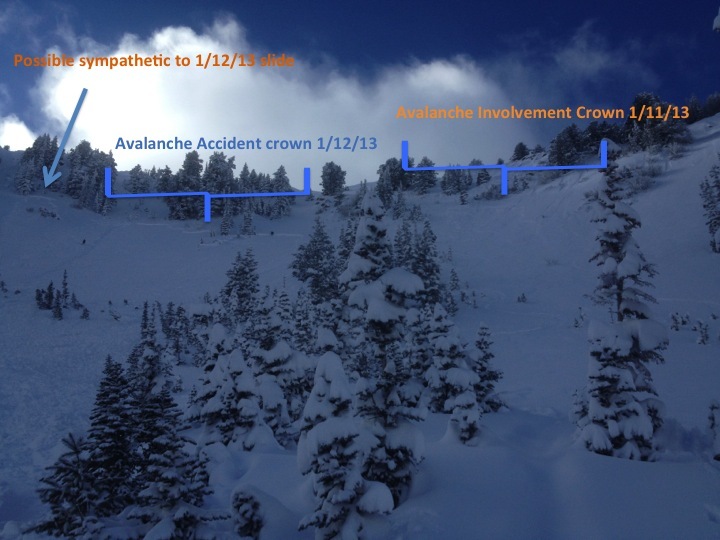 Family and friends who already think the backcountry is dangerous, please do not read on. 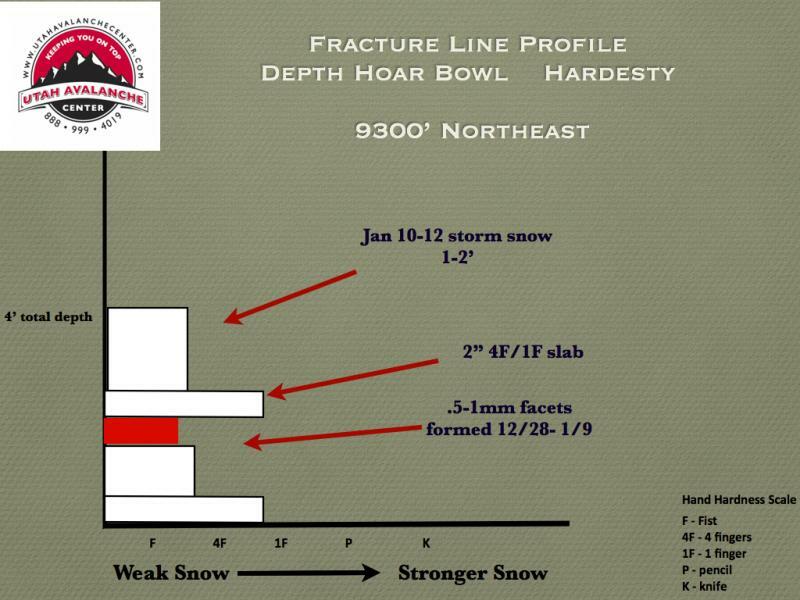 The entire details of the weather leading up to our accident and the analysis performed by Drew Hardesty when Andy, Emily, and I went back to the avalanche location with him the following day can be found on the UAC avalanche page. On Friday night, we had a party of 6 (Chad, Emily, Evan, Andy, Nick, and Gemma) who had planned a touring day on Saturday. The Wasatch had experienced an odd storm that brought more snow to the mid elevations than higher up. We thought Porter Fork would be a great location as it should have received significant snowfall and had some safe areas to ski. On Saturday morning, we visited with several friends at the park and ride. Three of them had skied Porter Fork the prior morning and said the snow was too deep on the less steep aspects to turn and we all knew the steeper aspects were not safe. We had a quick discussion and decided that Alexander Basin would be a great location to ski. This would be a little bit higher up than Porter Fork and therefore should have a little bit less snow making the lower angle terrain enjoyable to ski and there were lots of options in that area. We drove up Mill Creek on the unplowed roads and reached the Bowman Fork Trailhead. We donned skis and skins and started to break trail. After about 90 minutes we stopped for a quick snack and 2 groups of about 12 skiers passed us. This was a huge surprise to us as this area usually would not see that many skiers due to the long approach. After about 30 minutes the 2 groups split and we followed a group of 4 up to Yellow Jacket. We had a few short discussions with them about where they were skiing so that we could go to different places to avoid feeling ‘crowded’. They were going to ski something in the vicinity of Toots to Boot and over to Wilson Glade. We didn’t have an exact plan, but thought we would ski a run in Yellow Jacket, and determine our day by the safety of the snow pack. The ~3,600’ climb up to the ridge between Yellow Jacket and Alexander Basin took us only about 2.5 hours which we felt was good time based on the deep trail breaking. At the top of Alexander Basin, we had low light and poor visibility due to the snow still falling. We looked into Alexander Basin commenting on that being a nice line to ski a second run if the snow felt good on our first run. Due to limited visibility and not being as familiar with this area as other areas of the Wasatch, we didn’t realize that we were at the top of Depth Hoar Bowl which had slid the day before. We made a run into Yellow Jacket all commenting at the bottom how the low angle slope was not steep enough to make turns in due to the deep snow. When we reached the ridge the second time, our group had a thorough discussion about if we should ski the line below us into Alexander Basin or not. We all agreed that we would not ski higher up the ridge as it was steeper and too risky. We talked about the potential to ski 1 line a few feet further up the ridge, but also discounted this. In my opinion, this is where we made our mistake, we didn’t know that this was Depth Hoar Bowl and that it was the location of the Friday slide. We all discussed that this was at the steeper end of our comfort level based on the avalanche forecast that day, but we felt this could be safely skied by slope cutting, moving into a couple groups of trees, then skiing into a safe zone at the bottom. We had some discussion and all agreed that if we were alone, we would never consider skiing this line, but in a group we felt more safe as we had the ability to watch each other and in the worst case scenario, help out. Andy skied first. He dropped in, did a hand pit, was surprised to find only 6” of snow on the surface, then continued on cautiously. Once past the last group of trees he realized he was skiing bed surface from a previous avalanche. Emily skied second following Andy’s line closely. They met at our island of safety and both commented on having skied over debris from a previous slide. Evan skied third. He dropped in, made a couple turns and fell (most likely from hitting a chunk of debris). He then cut right towards Andy and Emily’s tracks. Realizing he was in debris, he cut further right into fresh snow. After descending about 2/3 of the slope, he was overtaken by a powder cloud. He at first thought Nick or myself had dropped in on top of him and had passed him (as a note, our group would never drop in on top of each other). He had started the run with his Avalung in his mouth, but after descending just over ½ of the slope onto a lower angle slope, he had removed it. He was then hit from behind by the avalanche. As he was pushed head first down the slope, he fought and swam and tried unsuccessfully to get his Avalung back in. While this was occurring, Andy and Emily also realized there was an avalanche as the snow and powder cloud passed by them. Emily and Andy quickly got into the rescue mode mentality making sure they slope looked safe, calling out to Evan, and going through their mental checklist of what they would need to do (get their beacon into search, getting their shovel and probe out, etc). When the snow stopped, they carefully edged out of the trees towards the debris. By time, Evan had his hand out of the snow, had cleared snow from his head, and was yelling for them. This was an immediate and major relief for Andy and Emily as they knew it would make for a faster rescue since his head was out of the snow and he had an airway. While this was going on, at the top, Nick and I had decided to ski a line to skiers left. Since this was a difference avalanche path, Nick dropped in when Evan was about half way down and prior to the slide. Realizing there was a slide, I told Gemma I was going down as fast as possible and for her to wait there until she saw me at the bottom. I dropped in, not know for sure where the crown was and followed as close as possible to Andy and Emily’s tracks. As I was descending, Andy thought it would be faster to take his skis off and walk up what we all assumed to be rock hard avalanche debris. He quickly realized it was a soft slab as he post holed up the hill. Emily kept her skis on and side stepped up. They both were able to yell to Nick who also started to descend to them. All 4 of us arrived within a few seconds of one another. Nick start to dig with his hands to get a better air pocket for Evan and look into the source of the blood on the snow next to his head. Andy and I got our shovels out and started to dig. Based on the position of his head, we thought he was buried standing up. We were lucky that he was actually horizontal so no part of his body was more than 2’ deep. As we completed digging Evan out, Gemma arrived safely at the bottom after having fallen on her descent. We were able to confirm that Evan was not injured and had only lost his poles. We all started to put skins back on to ascend the debris and investigate the crown when we heard and felt the loudest collapse any of us had experienced. The collapse was large enough that Gemma who was standing on the edge of the debris dropped 2’ into the snow. As quickly as possible we all headed down slope through the debris to get out of any future harms way. We found a safe area just down slope to dig a pit to analyze the snow that had just cause this slide. We were all amazed at the snow pit results. The layer that broke was not very reactive and had we dug this pit at the top with the same result, we all felt we would have felt it was safe to ski the line. Shaken up from the events, we all decided it was best to take the most direct route back to the car and call it a day. The descent from Alexander Basin is long (~5 miles) so we knew it would take us quite a while to get out (it took about 1.5 hours). We got to the car and decided it would be good to get a beer and submit the avalanche/accident report to the UAC together and it would also give us a chance to debrief. We spent a lot of time discussing the accident and all agreed that our largest mistake was not knowing that we were on top of a slide from the previous day. Having said that, skiing 1 day old debris is typically a safe descent route since it would be a rarity to trigger another deeper slide. We feel our slide was probably caused when we ventured off of the old slide surface and triggered adjacent weak snow that had not slide the day before. On Sunday, Andy, Emily and I went back to the scene with Drew from the UAC. We spent most of the day discussing the accident and the events that lead up to it as well as looking in detail at the slide crown. The photo below was our first view of the slide and it wasn’t until then that we realized it was much larger than we had initially thought (due to the poor visibility on Saturday). The crown was only slightly larger (we estimated 16” and it ranged from 11”-22”). We were also able to get a look at the slide from the previous day. Here is a good annotation from Drew of the 2 slides. The biggest thing that surprised us on Sunday were the additional tracks right next to our slide path. These tracks were both on slopes that we had decided were far steeper than we were comfortable skiing. The slide to the lookers left of ours could have either been sympathetic or triggered by one of these 2 groups. Tracks (circled in red) directly next to and just upslope from our slide. Both slopes were steeper than what we skied and were skied the same day. Since Saturday, we have all spent a lot of time talking and thinking about the accident. We have tried to determine if we made any huge errors and we do feel that our 2 biggest errors were in not knowing we were at Depth Hoar Bowl (Alexander Basin is a huge area and confusion of terrain in this area has been the cause of numerous accidents in the past) and that even through we knew there was weak snow beneath the new snow we thought we could find a safe descent route We also felt that we may have been clouded by the very stable snow we all skied for 2.5 weeks over Christmas. We were happy that we felt like we didn’t fall into any of the common heuristic traps (familiarity, acceptance, commitment, expert halo, tracks/scarcity, social facilitation). We went into the day with no agenda, just interested in skiing safely. Of our party of 6, only 1 person had been involved in a prior accident. With over 60 years of combined backcountry experience, we are lucky for this to have been our first accident and we all hope that we will take the lessons from this and not have another accident. It is very important to us to keep the friends we ski with and ourselves safe as we consider our friends are our family. Take extra time to know the names of the slopes you are on. In the past this has been difficult as there was not a single resource to find this. With the new Wasatch Backcountry Skiing Map, this is now possible. As our backcountry skills get higher, we venture onto terrain that has the potential to pose a higher risk. As Evan stated, ‘We didn’t see the forest for the trees.’ We knew there were dangers and thought we could safely pick a route down. This almost worked. As a group, in the future we will be looking more closely at our risk acceptance. Don’t let fall into the trap of thinking things are safer than they are based on pre-storm conditions. If the pre-storm snow is stable, it does not mean the post storm snow is. On the other side of this, if the pre-storm snow is unstable, the post storm snow will likely be more unstable. Please feel free to comment on this blog if you want, but please keep comments constructive. The skimo (ski mountaineering) race season is officially underway. There have been several small races this year, but the first weekend of January always marks the real beginning with a double header at Jackson Hole and Grand Targhee. 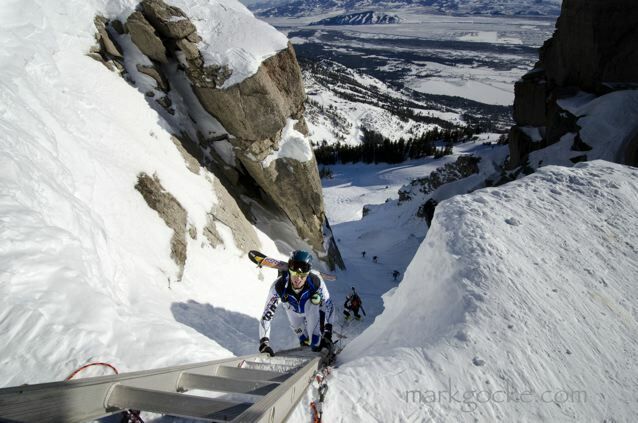 Saturday is the US Ski Mountaineering National Championships followed by the Grand Targhee Ski Mountaineering Classic on Sunday. The only way I can describe the Jackson race is that it is hard! There is over 8,000′ of climbing with steep and technical skinning and long booters including a ladder up Corbets Couloir. The descents are typical Jackson steep, narrow, rocky, and full of moguls. This is a full on race. To get up and race again on Sunday is always a challenge. Luckily, Grand Targhee is a little more forgiving. Other than the first climb, the climbs are not that steep and technical and the descents are mellow. We had a slow start to our snow in the Wasatch so I didn’t do much skiing in November. In addition, it really wasn’t until our Grand Canyon run that I felt recovered from Leadman. Starting in December I did quite a bit of resort skinning until we really started getting good snow the middle of the month. At that time, my work travel schedule slowed down enough for me to really start getting out. My December skiing was split into somewhat odd segments due to work and personal travel commitments. I really didn’t feel like I had a lot of ski time in and I only had about 8 runs at a resort which definitely hurt my downhill legs. The end of December was such good snow I skied as much as possible knowing that my biggest week ending 3 days before Nationals would not be good, but as I like to say, “Powder comes first”. After being in Crested Butte for the ISMF Course, I decided I needed a pair of Scarpa Alien 1.0. The price tag of this boot is over the top, but so is the performance so I thought I would give it a try. The boot doesn’t fit my foot real well and I am still trying to get the fit dialed in, but I was definitely not disappointed by the uphill performance of this boot – mind blowing is the only way to describe it. Based on my training, I didn’t have super high hopes, but thought if I had a good day at Jackson I could finish in 3 hours and maybe the top 20 (I finished in 3:33 last year). For Sunday I was hoping to be under 2 hours (I was 2:09 last year). Brent Mitchell and I left for Jackson on Friday noon and arrived just in time to get in a good lap at Snow King prior to race check-in and a Team Wasatch Skimo dinner. 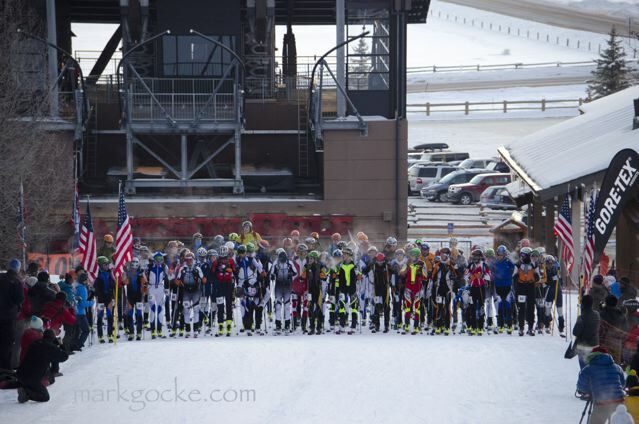 There was a great showing for the races from the Wasatch (15-18 Wasatch racers each day) and the Wasatch skimo skin suits looked great. The forecast for Saturday was bitter cold at the base and warming up high (due to inversion). The dinner conversations continually went back to how many layers, how to keep from having an epic skin failure, and who was going to podium. This year is a World Championship year and the top 3 finishers on Saturday and top 2 finishers on Sunday (who didn’t qualify on Saturday) make up 5 of the 8 members of the US National Team and get the honor or representing the US in February. Due to the race being a qualifier. the field was stacked. This would be the fastest skimo race ever held in the US! Gemma, Nick, Chad, and Eric sporting our Wasatch Skimo suits at the Grand Targhee finish – notice the Alien invasion. Saturday morning came and the weather did not disappoint us. It was -18F at the base at 7AM. It was rumored to be 20F warmer at the top of the mountain, but we still had to worry about preventing frostbite while warming up and during the early parts of the initial climb. As the race started, the front group as usual took off in a full sprint until the slope pitch picked up. The front couple of racers missed the first left corner and the front pack stayed close and fast for most of the race. For a first hand account of what happened up front, check out Andy Dorais blog that also has some great photos (thanks Dominique Maak) from the race. I was feeling good racing in the 2nd pack on the first climb. One of my ski goals this year was to climb 3,000′ in 1 hour. At the top of the first climb, I had done 3,300′ in 57 minutes. This had me pumped to keep up my hard pace. I suffered through the descents (the 8 runs I have made at Solitude was definitely not enough to build my downhill legs) and felt strong on the climbs. I reached the top of the Corbet’s Couloir ladder having climbed 6,400′ in 2:11. I was stunned that not only had I made one of my season goals of climbing 3,000′ in an hour, but I did double that in 2 hours. From this point we had a quad burning descent of close to 4,000′ followed by a final, long 1,300′ climb. I was able to pass a couple of people on the final descent, then get caught by Teague on the final climb, then pass Tom D on the last descent. I topped out at the last climb 2:50 into the race and pointed them down intent on finishing under 3 hours. The final descent was half big moguls followed by a low angle groomer. I did all I could to ski fast and in control through the moguls with legs that had nothing left, hit the groomer and dropped into a tuck (which was hard to hold with fried quads) into the finish line to finish in 2:55:17 (roughly 1.5 miles and 2,000′ in under 5 minutes) for 16th place. We all enjoyed watching the rest of the racers come across followed by pizza, beer, and awards. We ended a great race day with plans of another Wasatch Skimo dinner at a Thai restaurant in Jackson to relive the day and plan the next day’s race. A few beers, a restless night sleep brought, and an 80 minute drive the next morning brought us to the Grand Targhee Ski Mountaineering Classic. After the Jackson race, the Targhee race is not easy even though it is only 5600′ climbing. We all found that we needed a solid 30 minutes to warm up that morning to get the lactic acid out of the legs. Luckily, the race has a leisurely 10:30 AM start. After Saturday’s good race, I lined up ‘with the big boys’ in the second row. It was a great feeling a couple minutes before the gun go off to have Luke Nelson turn around and say ‘welcome to the big boys club’ (I can’t remember his exact words). The gun went off and we were off for another sprint to the first rise. The Targhee race is not steep like Jackson, but the first climb is a solid 2,000′ climb up a steep, hard packed groomer. It is a fully body effort to move up this climb quickly. I was excited to find myself close to the top and still have the lead group close and Luke still clearly visible. I topped out this climb in 29 minutes. I had surprised myself at how well I was climbing on ‘day old’ legs. The first descent was a great run with good snow and small bumps. A fast transition and we were into the shortest of the 3 climbs. I topped out the second climb at about 58 minutes once again beating 1 of my season goals by ascending 3,200′ in under an hour and this time with 2 transitions and a descent. The second descent was one of the most heinous skis I have ever done. the run was frozen, chunky, chundery, stump ridden, and just about the hardest thing you can ski on tiny, light gear. I was able to catch 2 people on this descent through some reckless abandon. We moved into the last transition for a final 2,000′ climb that never seemed to end. I was close behind Stano, Jon Brown, and Eric Carter hoping to be able to catch at least 1 of them. I put everything out there that I had and all I could do was hang on to them. They were ascending very strongly and I was not able to close the gap. We reached the top of the last climb for a short powder descent, then onto a groomer for a wicked fast descent. My goal for the day was 2 hours and I was able to finish in 1:53:27 for 15th place. My final descent was 1.7 miles and 2,000′ in 4 minutes! We once again enjoyed the finish line camaraderie cheering on finishers, enjoying a burger and beer and then packing up for the 4.5 hour drive home. For the first time since Leadman ended in August, I finally feel like I am functioning at 100% again. I can’t express how good this feels and then to top this off with such strong finishes. Fitness helped, I was not over trained, I had much better gear than last year (see photos below), and I keep asking myself if my new partially gluten free diet (I won’t give up beer and the occasional cookie) didn’t also help. How did this gear compare to last year, well, last year my ski, binding, boot combo weighed 2,608g (per foot). This year, that combo weighed 1704g for a savings of 904g (35%) per foot! I have found I don’t need to consume much in a 3 hour race. I ate a minimal amount of food.